A San Francisco cable car holds 60 people. This blog was viewed about 1,000 times in 2013. If it were a cable car, it would take about 17 trips to carry that many people. My dad always bought our Christmas presents on Christmas Eve. This was before online shopping, so people did actually shop in stores (as some still do.) I’m not sure why he waited until then, but it may have had to do with not having the money until he was paid, which seemed to happen right before Christmas. Once or twice Mother put money in a Christmas club at the bank (now there’s another antique concept!) but usually our Christmas was dependent on credit at the store and Daddy’s paycheck. I made a Christmas list, being careful not to ask for anything I knew we couldn’t afford, or at least, as far as I knew. Sometimes Daddy’s perception of what fit the bill was a little off. One year I asked for a guitar, and I got a plastic one from Santa Claus. Ooops! Not what I had in mind. But I was grateful and started learning chords. The next Christmas Mother made sure I got the real thing, a 1968 Sears Silvertone Spanish acoustic guitar, so I could look mournful and sing “Where Have All the Flowers Gone,” an essential for any moody teenager at that point. Sometimes Daddy got taken with a toy himself. At least that’s the only way I can explain receiving a Charley Weaver Bartender mechanical toy when I was pretty small (see photo above, from an eBay seller.) He was a character on Jack Paar’s Tonight show, invented and played by Cliff Arquette, telling old jokes and stories about “Mount Idy” and its residents. In later years he was on the Hollywood Squares, and a heavy user of double entendres. My family was teetotaling Southern Baptist. So it was a little odd to get a Charley Weaver toy which shook a cocktail shaker, downed the “drink,” then turned red and spouted smoke from its ears! If only I had kept that thing–it’s worth up to $200 on eBay at this point. So to all my family and friends who are celebrating Christmas, have a merry one! And I hope your shopping is done. I recently found a pecan pie recipe online which was a little lighter than the classic Karo syrup recipe. I made it a couple of times, then I began changing it up a bit. 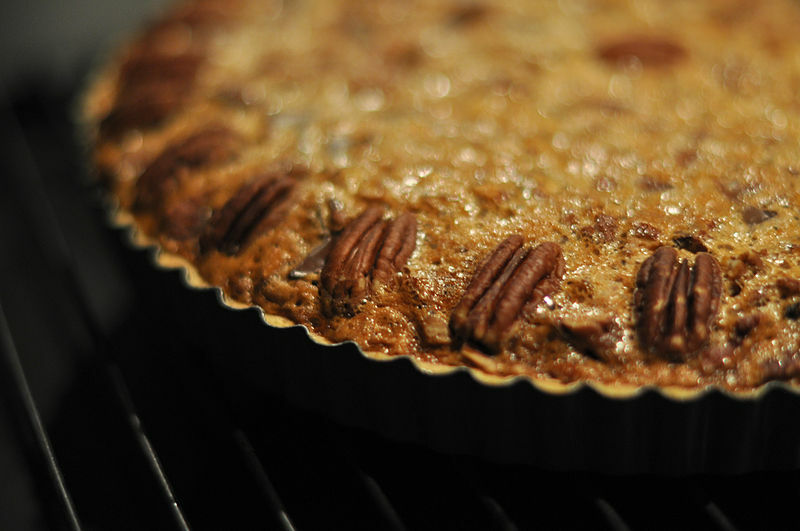 The first time I added more pecans–I’m sorry, 1/2 cup is not enough for any respectable pie. Then I went to bake it, found I was short on maple syrup and dark corn syrup (Karo), and had to improvise. The changed-up recipe is a new favorite! I’ll give you both the basic and supercharged versions. The basic version is still plenty sweet, but is lighter and has a faint maple flavor. The supercharged gets depth from a little molasses and is mellowed by the blend of corn syrups. Using an egg white gives a lighter texture to both versions. My friends say the little-bit-of-molasses version brings out the flavor of the pecans and goes well with a sip of brandy. I’ll let you be the judge of that. Preheat oven to 350 degrees. Place the syrups and ingredients through egg white in a large bowl; beat with a mixer at medium speed until well blended. Stir in pecans and vanilla. Pour into prepared crust. Bake at 350 degrees until center is puffed and edges are brown, about 50 minutes. I usually cover the edges of the crust with foil at the 30-minute point to keep them from browning too much. Cool on a wire rack. It’s a melancholy day here. I can’t believe it’s snowing this early in December. And it’s snow mixed with freezing rain, forecast to turn to black ice later tonight. Too miserable to go out, but I’m restless inside. When I was growing up in Tennessee snow was a rare occurance, and greeted with delight. A snow day! We got to stay home from school! I remember one storm when I was small that left over a foot of snow, something that almost never happened. My brother went out sled riding with his friends and got run over by one of the boys. The sled runner must have been sharp because it sliced his knee open and he had to have stitches. Ice storms were more common. They were actually frightening because the power could go out in addition to the roads getting slick. Once when I was home from college there was a massive ice storm and the power was out for a few days. Mother cooked on the wood-burning stove in the garage, and Daddy hauled water up from the well since the pump couldn’t work without electricity. It was so cold that Mother even let my German shepherd come in the garage with us. He was rarely allowed to come inside since Mother thought having pets in the house was low-class and dirty. Poor Chico was so happy! He always wanted to be an indoor pet, despite his size. In recent years we’ve had ice storms here, which used to be uncommon. One of my friends calls it “global weirding,” to explain the more violent weather we seem to get. Big parts of Connecticut were without power for weeks due to tree branches taking down power lines. So I guess a relatively mild snow and ice event is nothing to complain about. Still, I feel grumpy and blue. 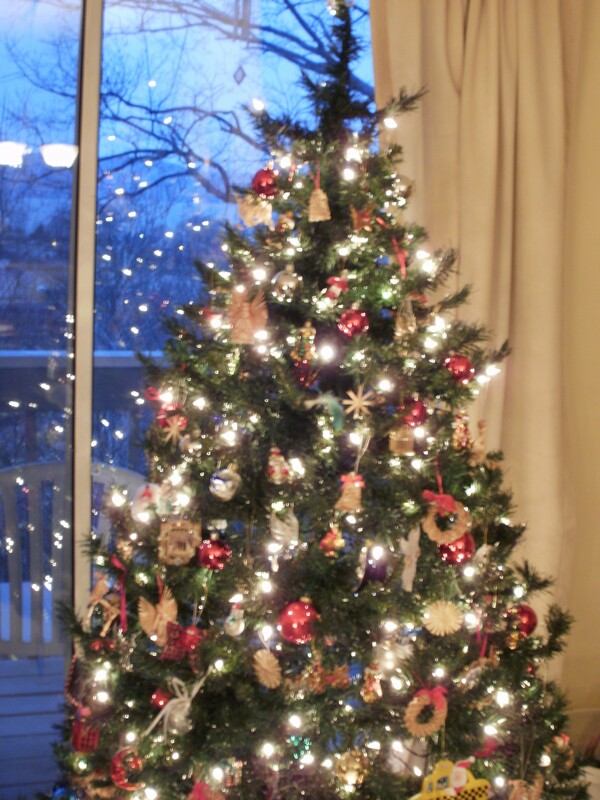 So I’ll post a picture of a Christmas tree and go watch some cat videos. Light activities for dark days! Any hints for cheering yourself up in the winter weather are welcome!